SP9 can be used for the abnormalities of saliva such as dry mouth. SP9 (陰陵泉) : Bend a knee. To slide with a finger inner side of the leg upwards from the ankle. If a bony bent side is reached, a finger will stop automatically. 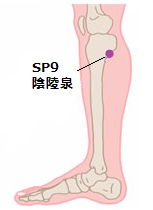 This point is SP9.